This weekend, I attended the Revitalization & Business: Focus Detroit Conference. It took place both in the city of Detroit and here in Ann Arbor, at the business school. It was an excellent conference on many levels, and so I am going to use this space to tell you about it. Detroit gets a bad rap. I used to spend at least a week every year in Michigan, and now I live here. And I can count the number of times I have been into the city on one hand. People are terrified of Detroit. They think it's unsafe. That no one would ever choose to live there. It is a city in the Rust Belt, home to the embattled American auto industry, suffering from massive emigration from its once-vibrant center to the sprawling suburbs and other areas of America. 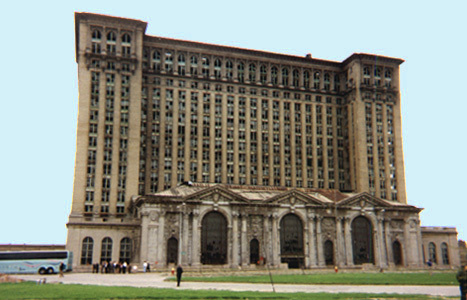 It is full of abandoned buildings, crime and corrupt politicians. More than any other place in the country, Detroit has come to symbolize America in this recession- an economy past its prime and going into decline while faster, smarter, cooler cities hurry to replace it. But that's not the Detroit residents see. They see grand old architecture (<-- click on the link! ), open space to grow food to feed a city, blank canvases that beckon artists, a culture of community and innovation, and a region that just needs people to believe in it (and live in it) for it to get back on its feet, dust itself off, and become great once more. Bill Ford (yes, of the Ford family) gave a speech at the conference and said that he hates the amount of sympathy Detroit gets. This is not a region that wants your pity, he said. And, one after the other, we heard from entrepreneurs and artists and community members from the city and while they were not so explicit in their words, the same theme was everywhere: Detroit is a vibrant and beautiful city. It's just that the rest of the world isn't looking at what's there. There's Model D, an online magazine that focuses on Detroit's distinct neighborhoods and spotlights people making big stuff happen all over the region. There's Torya Blanchard (<-- click that link, too! ), who cashed in her 401K and opened a French creperie which is now a huge destination in the city. And former male model Phil Cooley who came back to his hometown to open up one of the world's greatest barbecue restaurants, Slow's. The Eastern Market, one of America's largest and oldest public markets, open every Saturday with stalls and stalls of food, toys and crafts. Powerhouse Productions, using art as a means of developing community and engaging neighbors. Not to mention the magnificent Henry Ford Center, impressive Institute of Arts and newly renovated Art Deco Book Cadillac Hotel. Detroit is full of people who believe in it. Yes, the stories about abandoned buildings, crime and massive unemployment are true. But what's also true is that this is a city of entrepreneurs, idealists and artists. This is a city on the brink of what could be an amazing success story. In fact, it's a city that is already chock full of success stories. People just don't know about them. So I'm telling you. There is a lot of gloom and doom in the news every day, about horrible crimes, rampant corruption and the decline of America as an economic powerhouse. But there is a parallel reality, just as strong, that's comprised of success stories and people pursuing their dreams and making the little pockets of the world in which they live better. A lot of those people live in Detroit. And they're proud. I grew up in Michigan, and even went to college next door to you in Ypsilanti, and I think I've been to Detroit twice - once to see a Tigers Game (back at Tiger Stadium) and the second time on a field trip to the art museum in high school. Now I live in New York freaking City and I'll admit, I'm still one of those people who avoids Detroit and would prefer not to go there. Intellectually I know it's wrong (seriously, I can handle the Bronx and Manhattan after midnight but not a city in my home state?! ), but the city sure does need a good PR person to make sure those success stories get out there! Angela, one of the things we talked about over lunch at the conference was how NO ONE in Michigan even goes into Detroit. I know my aunt and uncle would always discuss how dangerous it was. As someone who grew up in the Chicago area and spent tons of time in the city through those years, I find that really hard to swallow and think it's so sad. 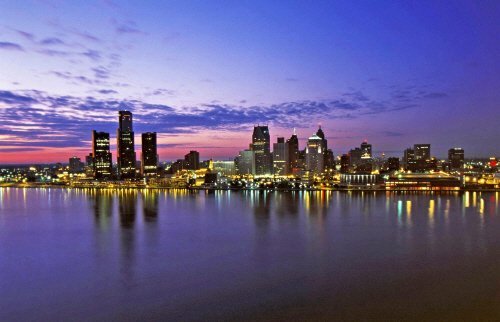 If even metro Detroit doesn't believe in Detroit, then the battle is even harder to win. I've actually been thinking about this and comparing it to a friend who came to visit my in NYC last year. She grew up in Philly and has visited the city tons of times - but she refuses to take the subway because she has it in her head they're scary/dangerous. My mom figures it's probably because my friend's parents taught her about the dangers of the subways in the 70s/80s. As a transplant from the midwest, I carry no preconceptions about the subway and accept them as relatively safe today. For me, instead of horror stories of NYC subways, I grew up with stories of the dangers of Detroit. My hometown is clear across the state from Detroit, so I don't know when I'll get a chance to visit the city, but I'll keep it in mind! I love rust belt cities. It kills me that so much population has moved away from the existing infrastructure (and all the embedded energy and resources used to create them) of the mid-west and northeast for places in the southwest where they have not only had to duplicate the infrastructure, but they are doing it in desert places (like Phoenix and Southern California) where they have to steal water from other states to thrive. And then of course there is the suburban development of the past 40 years that leave so many once-vibrant cities less than vibrant in favor of car-dependent places with miles and miles of the same. Sigh. Maybe as the south gets too hot due to Global Warming, people will move north again. Angela- That point is actually brought up in the movie. That a lot of people are scared of the city of Detroit because their parents told them it was dangerous. It makes sense in a way, as much of the suburban expansion was fueled by white flight and then no one ever wanted to go back, especially after the decline began. Sad, but definitely a factor. Thomas- Yes, yes, yes! It angers me so much, too! I don't even know why places like Phoenix and Vegas EXIST when there is no logical reason for them to do so, whereas almost every city in the Rust Belt is perfectly placed for water, power and transportation but we keep losing out to the southwest, every census. It is amazing how specific the impression of Detroit is. And the created image is never reality. Thanks for the info! I'll admit that my visits to the Detroit area did nothing to inspire me to linger longer. The city certainly has a scary reputation. I really like Thomas' comment; I am not sure I have ever considered his argument. I get it, I do. Great post, Aarti! Natasha from Heidenkind and I were just talking about Detroit a few weeks ago and the various photography books that are highlighting Detroit. Care- I mean, it's very much "up and coming," but to present it like some sort of ghost town is to only show one side of the story. There is a thriving and proud contingent of people that live there, too. Vasilly- Oh, that's awesome! Yes, there are a lot, though one of the videos talks a lot about how much the people hate those photographers who come to photograph abandoned buildings instead of the art scene, underground music, restaurants, etc. Trisha- It *is* specific, isn't it? I think in a way, people really like the poetry of having one city symbolize the decline of America. Except obviously, the citizens of Detroit aren't thrilled with that moniker. This post is so inspiring and really makes some great points about a city that gets a really bad rap. I am really glad to see that you posted this and listed all the great attributes of Detroit. 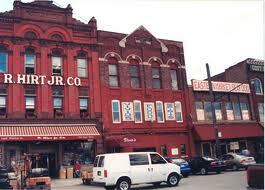 I hope that more people come to realize these things, and that the city is revitalized instead of reviled. Thank you for sharing this post with us about Detroit. The city gets a bad rap and that is unfortunate. My sister lived there for 15 years and loves the city. She's back in California now but always quick to defend her former city when people say disparaging things about it. I'll share your blog post about it. My parents were both born in Detroit. When we were back for my grandmother's 90th birthday, we drove through the city to see the house my Dad grew up in and his schools and various Important Landmarks of my parents youth. Now Mom watches Detroit 187 but it seems like only the Ambassador Bridge is featured.. I personally was gobsmacked to see that Detroit has DIRT roads! A big city! Well, as you know I lived in Ann Arbor for several years (and Billy Ford lived there too, although in a fancy part by the Huron River -- not sure if he still does)and the only time I ever went to Detroit was to visit the DIA (one of the best art museums I've ever seen) and the Fox Theater and some Red Wings games. I remember visiting Greektown once. While it has great spots here and there, it just isn't a place you can walk around like Downtown Chicago. And walking around at night time? Forget it. When we moved there in 1990 there were a lot of abandoned homes which since have mostly been razed. But the city hasn't gotten back to where it could be, and the corruption in its government (i.e. Kilpatrick) certainly hasn't helped at all. What people fail to take into account is what Detroit is up against in its own state. 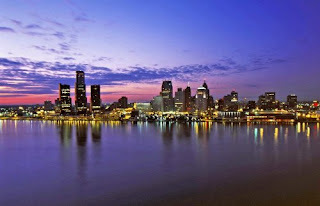 The Detroit suburbs (especially Oakland County) have everything you need, there is no reason to go into Detroit unless you gamble, go to a game or to patron a few restaurants. The Detroit suburbs are very affluent with a lot of money. Detroit in terms of drawing tourism is up against the rest of the state. Michigan has the most registered recreational vehicles (boats, 4wheelers, smowmobiles, PWC's etc..) in the nation and the longest fresh water coastline in the world. The residents (especially in the summer months) head elsewhere to enjoy and appreciate the majesty of the great state of Michigan.